Ubuntu 14.04 is a new version of Ubuntu operating system.It will release in next month. At this moment we use Ubuntu daily build version. Daily build versions available at cdimage.ubuntu.com. Since Ubuntu 13.10, we are facing a brightness issue on Intel machines. Brightness can’t control with slider. We found same issue on Ubuntu 14.04 too, that means Developers didn’t fix. Don’t worry we can fix it with simple tweaks. Follow below instructions and fix it. If you are using Linux mint 16 ( Mate ) you need to replace gedit with default MATE text editor. You can see gedit window ( gedit text editor), add these command and save. Restart or log off your computer. 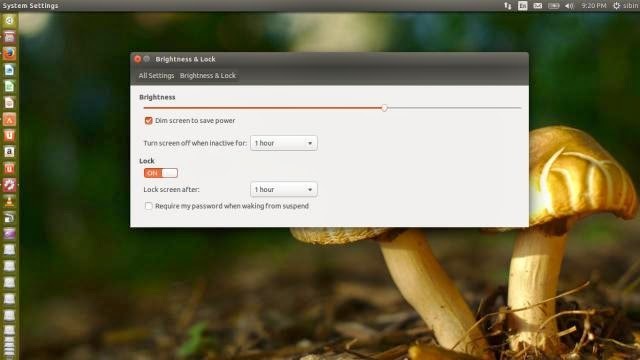 Open settings and select brightness and lock. You can see changes while moving slider. I took photos of my desktop, but all looks similar, But you can see changes with your eyes.